Anger is growing at the failure of the May Government to fund schools adequately, at the unhappiness of both staff and children in our ‘exam factory’ schools, at the increasingly obvious failings of thirty years of market-driven education policy. Parents and school staff alike will be hoping for news from this week’s Labour Party Conference in Liverpool that the promised ‘National Education Service’ will offer the radical change of direction that is so desperately needed. As Kevin Courtney has written in an article for the Conference bulletin of the Socialist Educational Association, ‘For Socialism and Education’, “These are not accidental failures. They are the products of austerity, and of an educational programme based on the core principles of neoliberalism – a marketised system, policed by a strong state”. Kevin continues, “We need a change on the scale of the 1944 Education Act to put right the failures of the 1988 [Education Reform] Act. They cannot be ended without investment, and without a bold redesign. Here the Party proposals have some way to go. The NES will need to be based on concrete proposals, as well as good intentions”. 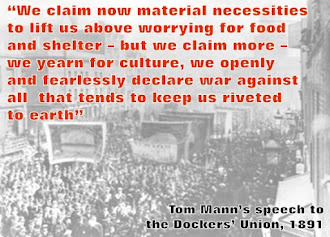 He goes on to list a number of proposals, including to “Restore the cuts made by Coalition and Conservative governments”, “Commit to ending the current system of testing in primary schools in its entirety … introduce the better systems of assessment for learning that we see in other countries” and “Take bold first steps to re-integrating all schools into a unified, democratically accountable system … including by allowing LAs to open new community schools”. These proposals (listed in full in the SEA article) – and others - are part of a growing debate within the Labour Party, and beyond, about a new direction for education. As I found when I spoke for the NEU at my local ward Labour Party, the debate will also open up discussion on long-standing contradictions within our school systems, including the place of faith, grammar and private schools. 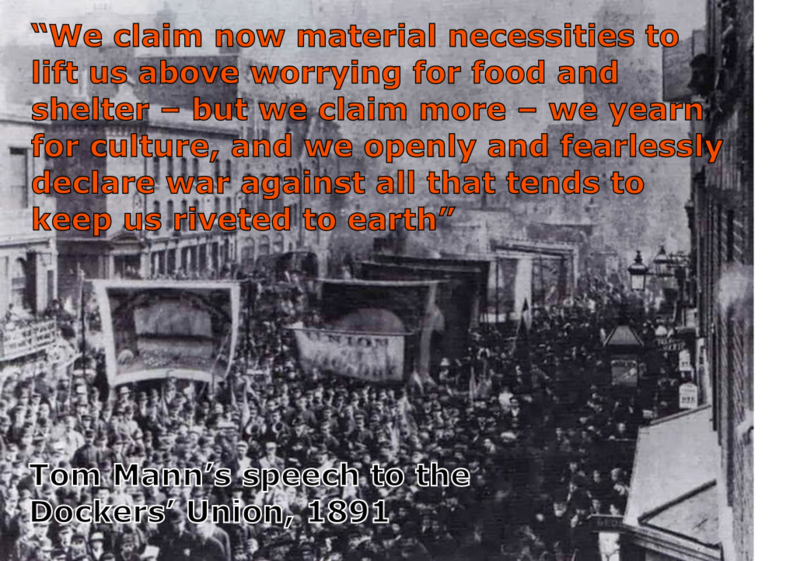 This is not a new debate but one that has been held throughout the history of our Labour Movement. Educational advances have been driven, in essence, by two sets of interests. On the one hand, employers and their political parties recognised that state expenditure on education would be necessary to produce a sufficiently educated and ordered workforce and electorate. On the other, the Labour Movement has sought to win educational change for workers' own advancement. At times those interests have coincided but tensions over the level of state funding available, and the breadth of the education to be provided, have never been reconciled. Those tensions are, of course, to the fore again today. Caught between these two pressures, middle-class efforts were often directed into maintaining their own educational privileges, particularly through the development of selective grammar schools and fee-paying public schools. Unfortunately, some Labour politicians, like Fabian Sidney Webb, set their sights on simply trying to help a minority of working-class children up into those middle-class ranks, rather than seeking genuine equality for all young people. It would take the 1944 Act and the later development of comprehensive education to extend the rights of all children to a genuine secondary education. However, as the post-war boom turned to downturn and neo-liberalism, those efforts were strangled by cuts and the ongoing marketisation of education introduced through the 1988 Education Reform Act. It was the 1870 Education Act that first started to properly legislate for elementary schooling, although only through a compromise allowing for both voluntary Church schools and fully maintained schools that continues to this day. Then, as now, there was a sad lack of recognition of a teacher's skills. An 1847 inquiry into Welsh education complained that: "No person , really qualified for the office by moral character, mental energy, amiability of temper, and proficiency in all the elementary branches of education, together with aptitude in imparting knowledge, will doom himself to the worst paid labour and almost the least appreciated office to be met with in the country". Sounds familiar? Sadly, if Government has learnt nothing about teacher morale and retention in over a century, the same can certainly be said when it comes to the damaging effects of compulsory testing and performance pay. The 1870 Act followed the introduction of the 'Revised Code', a device introduced to drive down costs by tying school funding - and hence teachers' pay - to the success rates in exams. Again, just as now, 'payments by results' led to enormous pressure on students and teachers to get the results required - by any means necessary. The newly-formed NUT summarised its objections as follows: "it had failed to provide the children with a good education; it had set up a false gauge of efficiency; it had necessitated a 'system of cram which encourages mechanical rather than intellectual methods of teaching', it had hurt both the bright and the slow; it had created suspicion between inspectors, managers and teachers; it condemned poor schools to continued inefficiency; and it had forced the same curriculum on all schools irrespectively". "Under the management of the elected representatives of the people"
If those two examples only show how little has been learnt from the past, then the final one listed here could yet be a solution for the future - the elected School Boards introduced under the 1870 Act. School marketisation, made worse by the expansion of unaccountable Academy Trusts, has created a broken system that urgently needs a radical overhaul. The model of elected School Boards, whose well-constructed school buildings still remain in many London boroughs, could be a way to repair the damage. Rather than just returning to Local Authority oversight, what about re-organising them under elected Boards that had direct responsibility for education? What about having a proportion of seats elected by different sections, representing, for example, unions, parents and the wider community? The School Boards set up after 1870 were no perfect solution. Depending on their make-up, they could run schools well or badly. However, particularly in the cities, they allowed pioneering candidates to be elected that introduced vital reforms, expanding education for working-class families, widening the curriculum and also introducing medical inspection and school meals. Socialist pioneers like Annie Besant in London, Margaret McMillan in Bradford and Keir Hardie in Scotland were some of the first Labour candidates elected. Though always in a minority, their achievements were impressive. For example, alongside educational reforms, Annie Besant made sure the London School Board introduced a minimum wage in all their contracts. Campaigns were also waged for secular education and the abolition of school fees while Margaret McMillan became renowned for the introduction of school meals and child welfare services in Bradford. Those campaigns are going to have to be waged again in today's austerity Britain where cuts to social services leave too many schools picking up the pieces where nobody else is left to step in. 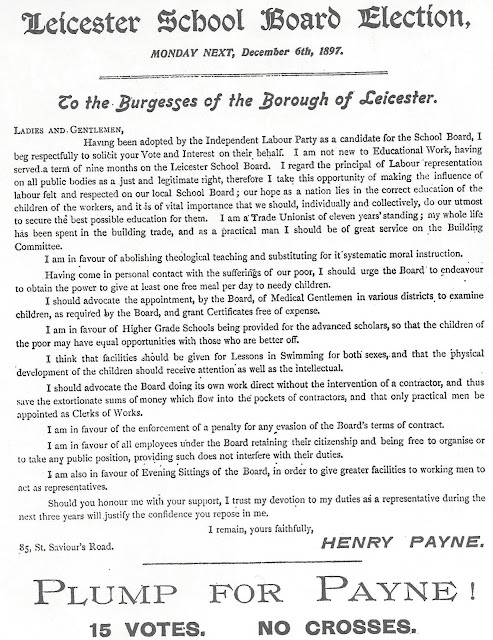 It was the very success of the School Boards that led to their abolition in the 1902 Education Act. The divergence between the differing interests of the employers and the Labour Movement came to the fore. The elected Boards were making reforms beyond the limits originally intended! 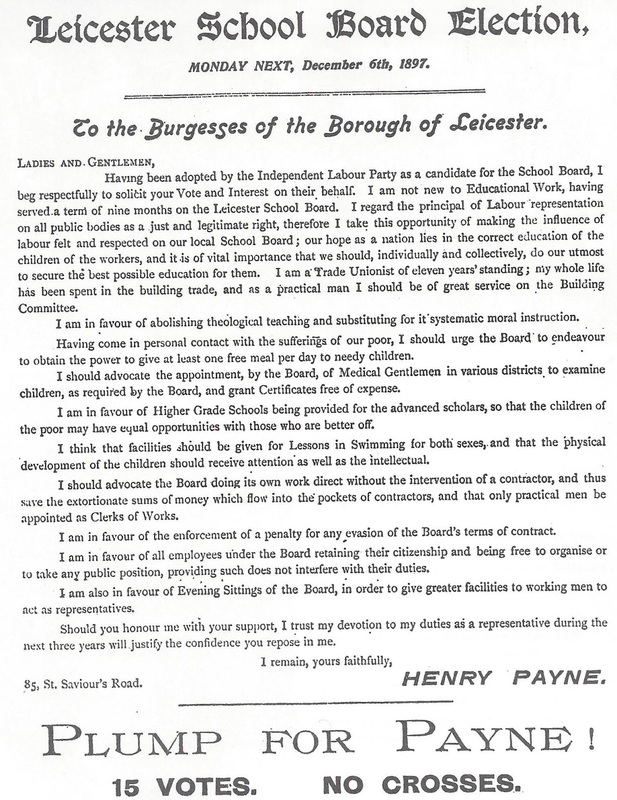 Although the struggle to remove the Boards was more complex than can be explained here*, county and borough councils were to be given the role of local education authorities and the elected School Boards were abolished. However, rather than leaving them in the history books, why not return to elected School Boards as part of a new radical step forward in advancing education in the twentieth-first century? *For a more detailed analysis of the period, I recommend Brian Simon's "Education and the Labour Movement 1870-1920"